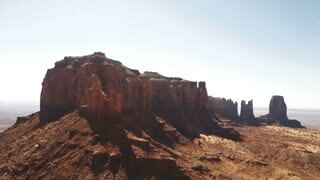 Drone camera tilts up to reveal American flag waving in the middle of Monument Valley, bikers passing by on desert road. 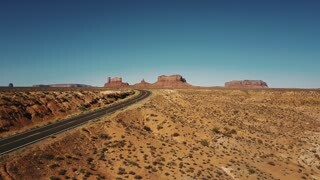 Drone follows car moving along iconic American desert highway road in Monuments Valley with big cliff mountains skyline. Drone flying backwards over iconic empty sandstone desert road in Monuments Valley, Arizona with big cliff mountains. Drone turning right above dry sandstone desert near incredible red rocky mountain and blue sky in Monuments Valley. 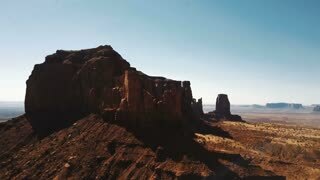 Drone flying close to tall cliff mountains of Monuments Valley in Arizona, car moving along wild dry desert highway. 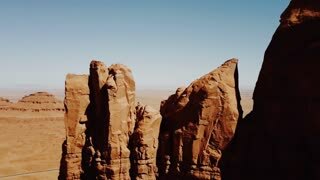 Drone flying towards epic rocky mountain in Monuments Valley national park, amazing sandstone empty desert skyline. 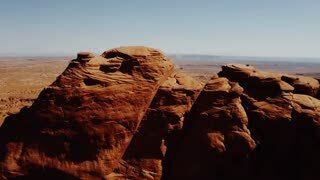 Drone flying over cliff in Monuments Valley, Arizona, to reveal car moving along highway in wide open desert wilderness. 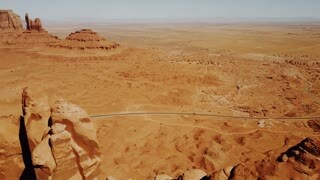 Drone flying to the right above empty desert road and cliff mountains of Monuments Valley in USA with clear blue sky. 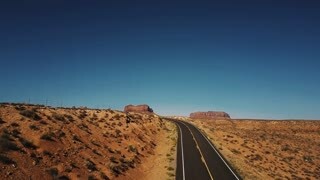 Drone flying left above empty sandstone desert highway road turn in Monuments Valley, Arizona with epic flat mountains. 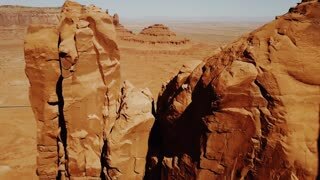 Drone approaching amazing rock cliff structures in the dry desert of Monuments Valley in Arizona, USA on a sunny day.